Open adoption is so important to me. It’s just as important to me now, six years after my son’s adoption, as it was in the beginning of the adoptive relationship. The question is: why is having an open adoption important to me? 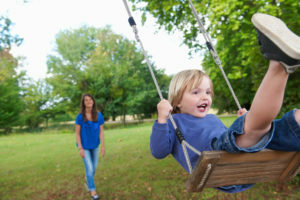 Having an open adoption means I stay connected with my child. Just because I made a decision not to parent every day doesn’t mean I don’t want to have a relationship with my child. I also believe that us having a relationship is better for him as well in the long run. The main reason that I chose an open adoption was because I didn’t want my child to have questions as he was growing up that would go unanswered. I didn’t want him to be confused about where he came from, or why he ended up where he did. I wanted him to be able to grow up in an environment that fully supported him being able to develop an identity based on security, trust and love. Having an open adoption means I can help offer him and his parents clarity as he grows up and has questions. There is more than enough love between all of us to satisfy his needs, and I haven’t disappeared from his life. I didn’t abandon him; I just play a different role in his life than his parents do. I’ll be honest, open adoption brings me comfort knowing that my son is doing well where he is now. When I get to talk to him and hear how happy he is, it gives me peace of mind and continues to encourage me to live my life. It’s a way for me to know that my son is safe and well taken care of, which was all I ever wanted for him. I love the pictures and the updates. I am proud of my son and who he is turning into. I also am proud of his parents for raising such a precious child. He wouldn’t be doing so exceptionally well if it weren’t for them. More importantly though is my main reason for choosing openness: my son. I have heard too many stories about children feeling abandoned by their parents because they were in a closed adoption. I knew people who were adopted and went searching for their birth parents, only to find them many years later. I desire to be accessible at any time for my son. Whenever he needs me, I am here. I am not his adoptive parents, but I am his birth mother and I take that role very seriously. I want to mention that sometimes closed adoptions are the best option. When a child’s safety is at risk, or it is just the wishes of the adoptive and birth parents, then closed adoption may be the wisest choice. I mention this because I believe in what’s best ultimately for the child, whether it is open or closed adoption. My experience is with open adoption, and when it is an option, I advocate for it. I see adoption as a way to change roles and extend a family. I did not place my child up for adoption so I could get out of my responsibilities associated with becoming pregnant. It wasn’t a decision I made out of maturity or grief. I genuinely made the decision for open adoption because I love my son, and I want him to have the best he is able to out of life. So doesn’t that mean knowing where he came from as well and having access to his entire family instead of being cut off from me? I have learned my boundaries over time. There are times when I need more contact, and times when my son’s parents need less contact. He isn’t at the age yet in which he fully comprehends where he came from. Interacting with me from time to time will make it much easier when it’s time for him to truly understand the role that I play in his life. I believe fully that his parents will do an incredible job explaining to him how he was birthed out of love, and given to them because of even more love than is almost possible. I believe that an open adoption is a way to teach a child more about how much love they actually have in their lives. Don’t we all want that for our children? You will know the medical history and other history that you may be interested in for your child. In a closed adoption, this information is not always made available. In open adoption, as the child grows and you have questions about genetics, your questions with be answered. You have an extension of family for your child. Your child will benefit from having so much love in his or her life as you express that love. You can be open with your child about where he or she came from, and how that child was chosen twice: by their birth parent and by you. You made a choice to love that child and you can express that openly as well as expressing that the choice the birth parent made was out of love as well. There is so much more love to give to your child with open adoption! The child will have all of his or her questions answered, especially the big ones. The child won’t be left confused, wondering where he or she came from and where their birth parent/s is/are. The child will have so much love from so many family members that they will grow up nourished and appreciated. Feeling loved will provide self-esteem, security, and a greater faith in their spirituality as they grow up. What child doesn’t like to show off pictures of themselves and know that there are others outside of the immediate home who truly value what and how they are doing in life? There is so much more love available to the child with open adoption! The grief process will be much easier, as what will be grieved is a specific role rather than a relationship. A mother changing her relationship with her child is a transition. A mother saying goodbye to her child is a loss. Having an impact of love and being able to provide important history information will make a birth parent feel special and like they are still a crucial part of the child’s life, even if it is a different role than what the adoptive parents play. There is still an outlet for a birth mother to love her child through an open adoption by giving gifts, receiving pictures and updates, and whatever else the open agreement entails. There is somewhere to pour out all of that motherly and instinctual love! Open adoption provides something incredibly special: Love.